A little pink monster who is Genki's tag team partner in many battles. Mocchi came into existence when Genki went to the shrine and unlocked his video game disk which turned out to be a Mystery Disk. 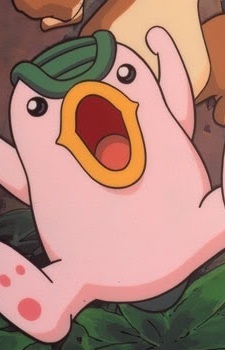 Although Mocchi's initial actions indicated that he was a very young child, he soon became a great fighter and a valuable asset in the search for the Phoenix. Like Genki, Mocchi is very brave and good-hearted. When in battle, Mocchi can move very fast by rolling into a ball like an armadillo and bouncing. He can also unleash very powerful attacks, like Cherry Blossom Blizzard and Mocchi Cannon.